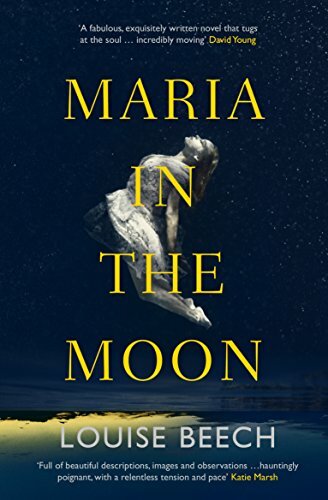 I'm delighted to be interviewing fellow Prime Writer, Louise Beech about her third novel, Maria in the Moon. It's a dark, beautiful novel of self-discovery and focuses on Catherine Hope an inimitable heroine who has many names and many sides - as Catherine she is the truculent and defensive step-daughter, as Katrina, she is the caring and sensitive Crisis line worker, as Catherine-Maria she is the sweet innocent child beloved of her Nanny Eve. But who is she really? She more than anyone wants to know. Yet while she can remember a great many things - including the birthday of practically everyone she's ever met - the whole of her ninth year is a blank. But as the murky floodwaters that devastated Hull in 2007 subside, long forgotten memories begin to surface and Catherine starts to uncover long hidden truths. Louise, I loved this novel and particularly how you wove together the Hull floods, Catherine's work on a Crisis line - which rings so true I feel there must be some personal experience there - and the emergence of Catherine's repressed memories. Can you talk a little about how the original ideas for the novel came to you? This book is darker than both of your other novels, How to be Brave and The Mountain in My Shoe, and at times it's a difficult book to read. Was it a difficult book to write? It is also interspersed with great humour - real laugh out loud funny scenes. Was that deliberate? As someone who is hugely self-critical, I edit as I go. It’s almost not conscious, as in it’s naturally part of my writing process. My first draft is usually more or less what it will be, aside from tweaks and improvements and tightening and juggling the odd scene. Though, having said that, book four - The Lion Tamer Who Lost, out next year! - had the most major rewrite of all. I realised one of my main characters was gay, having written him as heterosexual, and so the entire novel had to be changed in a major way. Quite the challenge, but very exciting. When I sit down to write, I read the previous five or ten pages to get in the zone, and off I go. On a bad day, I don’t have time to write. It can be tough with all the events and promoting involved and still having a ‘day’ job. On a great day, I’ve been known to write 4000 words. Those are the days I clap my hands and dance, haha. The concept of home and what that means is a theme that recurs throughout your novels. It's very strong in The Mountain in My Shoe in the characters of Conor, the feisty yet vulnerable boy in care, and Bernadette, the abused woman who mentors him. You return to it with Catherine, homeless and rootless after the flood. Why do you think you are drawn to this subject? Thanks Louise. Maria in the Moon is out in paperback on 30 September 2017, published by Orenda Books.